In honor of our one-year birthday, we’ve installed a sampler from our own open-stack, open-access collection of cultural ephemera from social movements around the globe. You’ll find everything from Chinese, Cuban, and Polish posters to posters made as part of queer, feminist, and housing movements; to pamphlets produced by striking students, anarchists, third-world liberation struggle supporters, and antiprison as well as social justice movements; to stickers from a host of contemporary events and campaigns, and just for fun; to LP records and songbooks of resistance; and dozens and dozens of political buttons capturing the history of Left political movements in New York City over the past forty years; a mix of T-shirts and other fabric-related creations; to leftie newspapers and comic books. Below you’ll find the text that accompanies the materials on our wall. Read it over to get a sense of the history, and then stop by to see it all (and lots more) for yourself. This poster says “The Sun Is in Our Hands,” and is one of almost two dozen Chinese posters from the late 1950s through the late 1960s that we hold in our collection. In addition, Interference has a dozen books on Chinese posters and printmaking available for research. Redback Grafix was a 1980s’ political poster collective based in Sydney, Australia. Although originally rooted in the punk rock movement, it built solidarity with working-class and Aboriginal communities, eventually producing powerful posters such as the one displayed here. Below it is a poster by the Garage Collective, a contemporary design and screen-print workshop based in New Zealand. “End the Ugly Plastic War” was produced by the Political Poster Workshop of striking students at the University of California at Berkeley in 1970. The student strike—the largest strike in the history of the United States—was called to protest President Richard Nixon’s decision to bomb Cambodia. Most of the Berkeley-produced posters were screen prints, but some of the students found a vacuum-sealing machine and produced clear plastic posters like this one. This poster was donated to the archive by Marty Lucas, who participated in the poster workshop. These seven pamphlets were all produced by the Liberation Support Movement (or LSM), a North American political group dedicated to building solidarity with popular struggles in the third world, mostly armed and in Africa. The group’s combination of spot-color offset printing and naive design sense created some of the most visually arresting political pamphlets of the decade, and the content is some of the few first-person narratives available of rank-and-file members of these movements. We have over two dozen LSM publications in the collection—most of what the group produced. In the fall of this past year, lifelong political activist Eleanor Bader donated her button collection to Interference. This is just a sampling of the hundreds of political buttons and badges that she gave us. Together, they tell us a lot about the history of Left political movements in New York City over the past forty years. This poster reads, “It will be laughter that will bury you: In 1905 Paris, the police arrest an anarcho-syndicalist during a strike, who shares the laughter of the working class.” This is a reproduction of an Italian political poster, originally produced by Militant Red Relief. Music is an important part of social movements, and here at Interference we have a broad selection of recorded music as well as songbooks and other musical ephemera. These dozen LP records are a good sampling of our holdings, including international music from liberation struggles, political folk music, anarchist punk, soul and jazz emerging from black liberation movements, and lesbian and feminist musicians. Interference Archive has a collection of several hundred newspapers, the majority from the 1980s to the present, but also a select collection from the 1940s through the 1970s. Here is a good representation: Class War was the most popular UK anarchist paper in the 1980s; Winter Soldier was the newspaper of the Vietnam Veterans against the War organization; Rising Up Angry was produced by the Chicago group of the same name—a white antiracist organization in the 1970s; L.A. Today is a spoof newspaper produced during the Los Angeles riots in 1992 and wrapped around actual USA Today papers; Love and Rage was a long-running US anarchist paper, of which we have almost a complete run; and CARF is an antiracist newspaper from the United Kingdom. This image was produced by ASARO, a collective of printmakers who came together in 2006 in Oaxaca, Mexico, in support of a teachers’ strike that developed into a broad regional rebellion. It merges the historical figure of Emiliano Zapata with his contemporary namesakes, the Zapatistas. The image is a woodblock, printed on an inexpensive and pulpy paper often used to wrap tortillas. The piece below it was screen printed in the late 2000s by the San Francisco Print Collective as part of a street art campaign against anti-homeless laws being passed in the Bay Area. This poster is by Dea Trier Mørch, a Danish feminist and communist printmaker and author who was part of the cultural collective Røde Mor (Red Mother). This piece collects images produced for her book In the City, the tale of a political family living in Copenhagen. Below it is a small collection of other types of materials found in Interference Archive around communal living, free schools, the environment, public art, and indigenous resistance. This collection of pamphlets is part of a larger group of do-it-yourself culture handbooks that we’ve collected here. From printing to posters, puppetry to property destruction, it’s all explained in these pages. Some instructions are clearly more useful than others, but they all tell us something about how people organize to spread their messages and ideas. Fabric and fashion have been important to many movements, and we collect examples here. Arpilleras, anti-Pinochet artworks, were created by women whose family members were disappeared during the right-wing coup in 1973 and the following dictatorship. This is one of two recently donated to the archive by Hester Eisenstein and Michael Tanzier. Below it is a handkerchief embroidered by campesinos in the Zapatista-controlled areas called Caracoles. Hanging from above are a dozen T-shirts, a popular marker in the United States and elsewhere of personal political affiliation as well as a regular fund-raiser and marker of a specific event or activity. We’ve amassed nearly one hundred political and countercultural T-shirts here at the archive. Not everyone loves to read heavy theory, and not every context works for the production of a poster. Movements across the globe have turned to comic books and graphic novels as a tool to reach and educate people. Comics are a great example of social movement culture, and we are proud of our quirky and diverse collection, a small sample of which is represented here. South American guerrilla organizations, the costs of war, a late 1970s’ boycott of Coors beer, police violence, and the basics of Marxism can all be explained in the pages of comic books. Lucy Parsons is one of the US labor movement’s most important agitators. Part black, native, and Mexican, she was a committed anarchist and socialist, an editor and publisher of multiple movement newspapers, and spent most of her life as a labor organizer. This block-print portrait was designed and printed by Carlos Cortez, a World War II resister, itinerant laborer, and lifelong member of the Industrial Workers of the World. Interference has a large collection of materials related to international labor movements, particularly those initiated by rank-and-file workers, organized by those often marginalized by mainstream unions, and antiauthoritarian in organization and political outlook. The three posters here both represent feminist and queer movements, but each was also produced by a movement printshop or graphics collective, including Red Sun Press in Boston, Red Pepper Posters in San Francisco, and Inkworks Press in Berkeley. The archive has strong concentrations in both feminist and queer politics as well as the output of movement printshops. 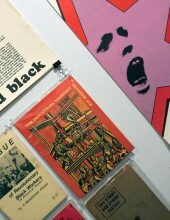 Below the posters are a collection of six pamphlets produced by Fredy Perlman of Black and Red Press, all printed by Perlman at the Detroit Printing Co-op in the 1970s. Perlman was an anarchist printer, theorist, author, and ecologist, and we have a large collection of materials related to his work here. The International Hotel struggle is arguably one of the most significant housing struggles in recent history in the United States, but is little known outside of San Francisco, where it occurred. This poster remembers the fight by Filipino and Chinese residents to maintain their apartments and community. San Francisco has long documented its struggles in poster form, and Interference has a nice collection of recent Bay Area political posters. Poster culture has been on the wane in most of the United States for a couple decades, but it is still vibrant in many countries, including Germany. Some of the most prolific poster producers in Germany are the different factions of Anti-Fascist Action. These posters are well known for their use of pop culture and wide-ranging aesthetics. Dozens of groups in a half-dozen cities have been producing posters for forty years. We hold a large collection of these as well as other German political posters. This is a small selection of the anarchist pamphlets, zines, and journals housed in our archive. Ranging mostly from the 1960s to the present, we have an eclectic range of publications from the ultra Left. Interference Archive grew out of the personal collections of Dara Greenwald and Josh MacPhee, both of who were deeply involved in punk rock music culture in the late 1980s and early 1990s. Both of their collections of flyers for punk shows are housed here. Another form that housing struggles take, particularly internationally, is represented by the squatting movement. This T-shirt and poster are both from Christiania, one of Europe’s largest and longest-running squats, which is not simply a house or building but rather an entire village that has existed on the edge of Copenhagen since 1971. We have been fortunate to partner with Alan Moore and his House Magic project, bringing a flood of European squatting movement materials into the archive. The archive has significant holdings of materials related to prison movements and social justice. This screen-printed poster was produced (and donated to the archive) by Peter Moore, in solidarity with the Attica prison revolt in 1971. These pamphlets are a small sampling of the prison-related publications that Interference contains. Partyzant Z Lelejskiej Góry (Partisan in the Lelejska Mountains) is a Polish poster for a 1968 Yugoslavian film about antifascist partisans during World War II. Polish posters are renowned not only for their creative design sense but also their sly political commentary, often subversively critical of the Polish Communist regime. We have a small collection of Polish posters at the archive. These two posters, both in support of Palestine, were produced by the Organization in Solidarity with the Peoples of Asia, Africa, and Latin America (OSPAAAL) in Havana, Cuba. OSPAAAL is well known for its colorful and innovatively designed posters produced from the late 1960s into the early 1980s. Most are international solidarity themed, and in that spirit the text contained on them is in four languages—Arabic, English, French, and Spanish. We have over three dozen OSPAAAL posters here as well as posters produced by other Cuban organizations. Stickers are one of the simplest and most inexpensive forms of propaganda that social movements can produce. Anyone can carry a pile in their pocket, and turn every lamppost and mailbox they pass into a mini-billboard. Because they are so diminutive and ubiquitous, stickers are overlooked by many people (and archives! ), but we have a massive collection of political and countercultural stickers from the past thirty years.